Matt Damon revealed he might make a cameo in the upcoming “Ocean’s 11” spinoff, “Ocean’s 8,” starring a powerful female cast that includes Sarah Paulson and Sandra Bullock. “Ocean’s 8” will also star Anne Hathaway, Helena Bonham Carter, Cate Blanchett, Mindy Kaling and Rihanna, and will be directed by “Hunger Games” filmmaker Gary Ross. This summer, Ross described the film as a continuation of director Steven Soderbergh‘s “Ocean’s 11” trilogy, which starred George Clooney, Brad Pitt, Don Cheadle and Julia Roberts (who is quite friendly with Blanchett, so let’s start speculating about other cameos now). Damon starred as Linus Caldwell, one of the newcomers in the group and the son of a legendary con artist. 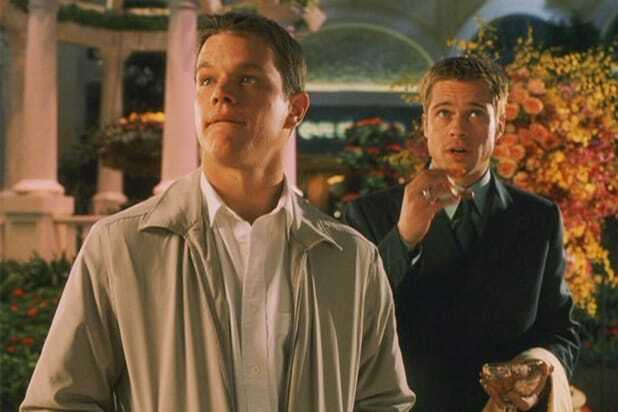 The three previous “Ocean’s” movies combined to make $426 million domestically and $1.1 billion worldwide. 2001’s “Ocean’s 11” was a remake of a 1960 film of the same name starring the Rat Pack. Warner Bros. will release the new film on June 8, 2018. Matt Damon was just 18 when he made his movie debut with a small role in 1988's "Mystic Pizza," which was also the second feature of Julia Roberts. In 1992's "School Ties," Damon played a prep school bully who antagonized a Jewish student played by Brendan Fraser in a naked shower room fight. Damon grew a peculiar, Ethan Hawke-like goatee for his role as Lt. Britton Davis in 1993's "Geronimo: An American Legend." Damon played a drug-addled Gulf War veteran opposite Meg Ryan in 1996's "Courage Under Fire." For the "Courage Under Fire" role, Damon famously dropped 40 pounds off his already thin frame -- without a doctor's supervision. Damon was back in fitter, hotter form in the 1997 John Grisham adaptation of "The Rainmaker." Damon and his childhood buddy Ben Affleck co-wrote the script for 1997's "Good Will Hunting," and the two starred opposite Robin Williams. In 1998's "Rounders," Damon had an unfortunate blond dye job to play a law student struggling with a poker addiction opposite Edward Norton. Damon played the title character in Steven Spielberg's 1998 WWII epic "Saving Private Ryan." In 1999's "The Talented Mr. Ripley," Damon was a creepily seductive sociopath who pined for Jude Law's trust fund lifestyle (and his body). Damon's wasn't so shabby either, despite the bright yellow bathing suit. Damon teamed with George Clooney and Brad Pitt for the first time in the star-studded 2000 caper "Ocean's Eleven," which spawned two sequels. In 2001, Damon reteamed with Ben Affleck to executive produce "Project Greenlight," a reality series that aired on HBO and chronicled the making of an indie film. In 2002, Damon showed surprising action-hero moves as a trained government agent with amnesia in 2002's "The Bourne Identity." Damon had an uncharacteristic punkish look (including a shaved head) in a cameo in 2004's "EuroTrip." He played the lead singer of a band whose main song, "Scotty Doesn't Know," reveals that Damon's been banging the longtime girlfriend of the movie's high school grad lead. Foreshadowing of his later Jimmy Kimmel stunt? In Martin Scorsese's 2006 thriller "The Departed," he goes mano a mano with Leonardo DiCaprio. He was back in fighting form in 2007's "The Bourne Ultimatum" -- which looked like it might be the final installment in the franchise. In 2007, People Magazine named the self-described "aging suburban dad" the Sexiest Man Alive. Damon has long been the affectionate target of ABC late-night host Jimmy Kimmel, who ended his show with apologies for running out of time for the actor. But Damon turned the tables in 2008 when Kimmel's then-girlfriend Sarah Silverman introduced a videotaped song declaring, "I'm F---ing Matt Damon." Damon packed on 20 to 30 extra pounds to play a schlubby corporate whistleblower in Steven Soderbergh's 2009 comedy "The Informant!" Damon earned an Oscar nomination as Best Supporting Actor portraying the captain of South Africa's championship 1995 rugby team in 2009's "Invictus." Starting in 2010, Damon had a recurring role on "30 Rock" as an airline pilot named Carol who tried to woo Tina Fey's TV exec Liz Lemon. Damon got buff (and tatted) to play a paroled car thief fighting to survive in a dystopian future in Neill Blomkamp's 2013 sci-fi movie "Elysium." Damon earned an Emmy nomination for the 2013 HBO movie "Behind the Candelabra," camping it up as the much-younger boyfriend of the flamboyant pianist Liberace (Michael Douglas). 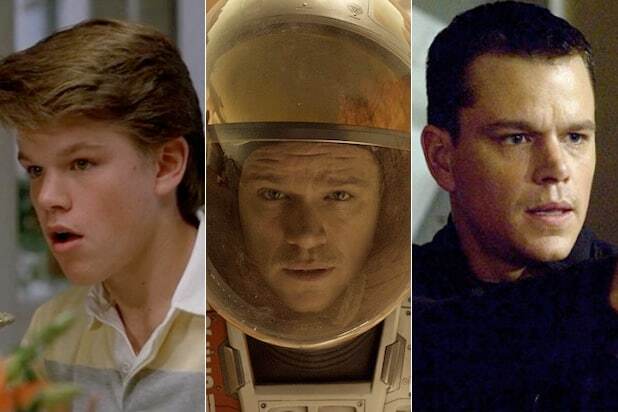 Damon earned his third acting Oscar nomination for Ridley Scott's 2015 space drama "The Martian" -- playing solo for much of the film as an astronaut stranded on the red planet. After nine years, Damon returned as "Jason Bourne" in his fourth installment in the action franchise. Damon stumbled with a big-budget dud -- and a freaky ponytail -- in Zhang Yimou's 2017 fantasy epic "The Great Wall." Damon reteamed with director George Clooney for the 2017 period drama set in an all-white suburb in 1959. In Alexander Payne's high-concept 2017 movie "Downsizing," Matt Damon and Kristen Wiig play a couple who decide to shrink themselves -- literally -- to live in a more affordable micro-world.